WASHINGTON — The Afghan and U.S. governments played down their political differences Wednesday, rejecting reports of a major dispute between the Obama administration and President Hamid Karzai. Supportive statements by the U.S. State Department and Karzai's spokesman followed a week of increasing tension between the governments. On Tuesday, the White House indicated it could call off a scheduled May 12 visit by Karzai to Washington. In a place where women have few rights, it seems improbable women would plead for men's advancement too. But, it's happening in Afghanistan. Not for the reasons you might think, but because many Afghan women realize without the support of fathers, brothers and uncles, they will remain second-class citizens. For years, the United States has developed and funded special "women's only" programs to help women start their own small businesses. And while those efforts have been greatly appreciated, some global women's groups wonder if these programs are as effective as they could be when it comes to achieving equality in a patriarchal society. The unrest in Kyrgyzstan could complicate U.S. efforts in Afghanistan, according to some reports Wednesday. “The instability highlights both Kyrgyzstan's vital role for the U.S. war in Afghanistan and the compromises both Presidents George W. Bush and Barack Obama have made to deal with an increasingly unsavory regime,” writes Dan Murphy of the Christian Science Monitor. Deirdre Tynan and Kadyr Toktogulov of the Wall Street Journal write: “The U.S. military base outside the Kyrgyz capital is vital to the expanding American war effort in Afghanistan. Most of the U.S. troops deploying to Afghanistan first pass through Manas, which also handles the majority of the American fuel, food and ammunition shipments to the war zone. 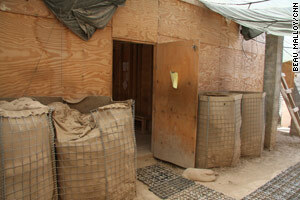 A wooden shack with a few phones and computers is the only link home for some Marines. Northern Helmand Province – U.S. Marines stationed in Now Zad only have one link to home – a small wooden shack in the middle of their base. Inside, they crowd around five or six telephones and around eight computer stations. This is where troops connect with their families and friends, and find out what’s happening in the world beyond Camp Cafferetta. While embedded with the 1st Battalion, 2nd Marines Alpha Company, it’s also where we go to call back to our desk in Atlanta or reply to emails – only, of course, when there is a free phone or computer that the Marines aren’t using. The tiny room is crowded - Marines literally pushed against each other to wiggle into the small spaces in front of the computer screens. One Marine is on Skype, with a grainy video image of his wife and kids on screen. His wife is telling the very young children to look into their camera back home, and “tell Daddy you love him.” Most of the younger Marines are pouring into their Facebook pages, their primary way to keep up with friends – and most especially girlfriends – back home. A few feet away, you can hear the constant overlapping chatter from four to five Marines on the phones, talking to folks back home. And then – a gunnery sergeant bursts into the room and says “River City! We’re in River City, let’s go!” And just like that, Marines hang up their phones. Sever their Skype connections. And shut down their Facebook pages. There was maybe time for a very quick goodbye, but it literally takes seconds. Within a minute, the room is empty, and the sergeant takes out the bank of phones and locks the door to the Internet room. WASHINGTON - The State Department has problems managing dozens of planes and helicopters it uses in the fight against illegal drugs in Afghanistan and Pakistan, according to a new Inspector General's report.